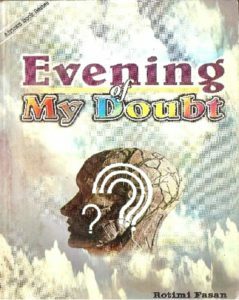 Evening of My Doubt explores the endless vista of contraries associated with living and dying in contemporary human society. It is conceived in four diverse but related sections, each of which delves into the complexities of existence with motifs ranging from the very personal and intellectual to the socially relevant. It draws its imagery from the everyday struggle to ride in a battered molue and the anxiety of putting garri on the table. It explores the philosophical import of individual and social experiences in a language that is exceptional for its originality, fluid and breezy imagery, and economy. It is a new voice, but also a strong and positive one in the development of contemporary African poetry.